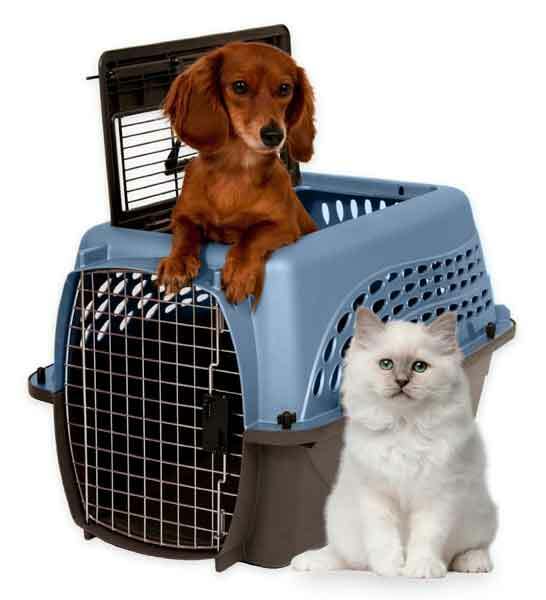 Looking for the best cat carrier for your pet? I know the feeling, you want something practical, safe and comfortable for your cat that is easy to clean and will last. There are many different types of carriers on the market these days and they can range from cheap to expensive to ones that will disintegrate after a few used to ones that last for many years. One this page I have chosen my own personal favorites. They very much differ in style and price but I feel they give a broad range of choice for all pockets and needs. Will you be able to easily store it when it is not in use? Will it be something I will be happy to use for a long time? How easy will it be to carry? Is it big enough for my cat? Sleepy Pod - The Mobile Pet Bed! Wow! 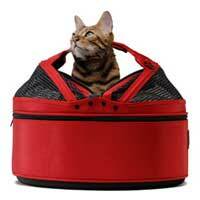 This must be the ultimate pet carrier and number one in my top four best cat carrier choices. 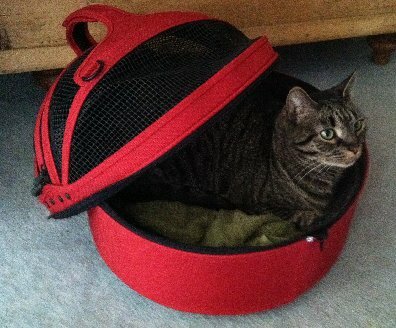 Actually you should think of the Sleepy Pod as a mobile pet bed rather than just another carrier. I thought this was a great idea as soon as I saw it. This is because we usually only use cat carriers when taking kitty to the vet. This often means that as soon as they see their carrier, they think "Uh oh.... it's vet time" and usually run and hide! Travel can become a traumatic experience for both you and your cat. However, with the Sleepy Pod, your kitty can use it as their regular bed indoors. Then, when you need to take them out and about, you simply zip on the top and go! This way your cats won't just associate their carrier with a nasty experience and any journey will be far less stressful for you both. So if you would like to give your cat the best in travelling experience, then take a look at the video and click here to find out more about Sleepy Pod, the mobile pet bed ! I have never seen a cat carrier like this before but I think it is fantastic, especially for those long car journeys where you may be worried about letting your cat out during a rest break. 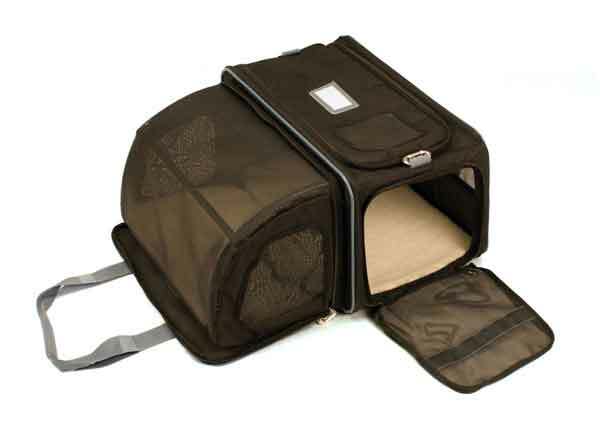 The side panel of the carrier folds down to allow for extra space for your cat to stretch out and relax. With removal pads and three ways for your cat to access the carrier (Top , back and front), this carrier is definitely in my top four best cat carrier. This space carrier is a lot cheaper than it looks to buy too which surprised me. If your looking for something that is both versatile and easy to carry then this is my choice. The carrier can be used in Five different ways. I like the fact that your cat will be able to both sit, lie down and stand if they wish in this carrier which is great for long journeys. There are also plenty of viewing panels for your cat to see out of if they wish, or if they prefer to hide away they can by curling up at the bottom of the carrier. This rolling / rucksack carrier is very practical, which is I think suitable for all sorts of trips, both car, to the vets and at the airport. These are lightweight, strong and practical and are especially good for those trips to the vet or cattery. Some of these cat carriers even have special seat belt attachments so you can secure them in your car which I think is an excellent feature. I have two of this kind of pet carrier for my boys Byron and Shelley. When I take them to the vets I always put newspaper in the bottom in case of any accidents and then also put one of their cushions or blankets in as well, so that they feel comfortable and at home. 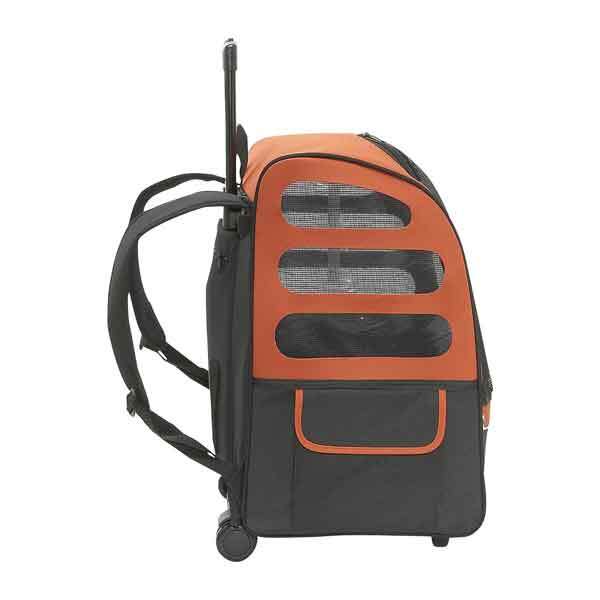 This practical type of cat carrier which you can see here usually has a top that is easy to clip on and off for easy access. I find this especially useful, as when we are at the vet my Byron is almost always determined to stay in his carrier and not come out!